Operating systems are full of hidden features which are left to us users to explore, which is best done by right-clicking everything you see (or not see, in this case). Windows 8 provides us with a rather hidden menu which had better been more visible, since it actually is quite useful. To get to it, point your mouse to the bottom left corner (where the Metro switcher pops up) and right-click. 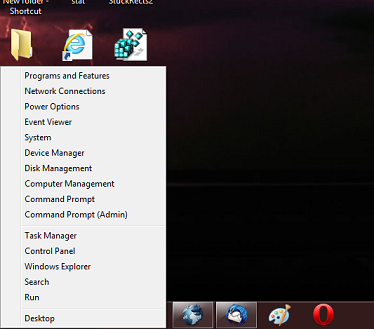 The menu gives you quick access to many functions you might use frequently such as opening a new explorer window, the Task Manager, Control Panel, the Run prompt and even a direct link for an elevated Command prompt (and with it, the option for an elevated PowerShell). The menu also works from the Metro UI.